I purchased this light for my front porch. Absolutely love it! 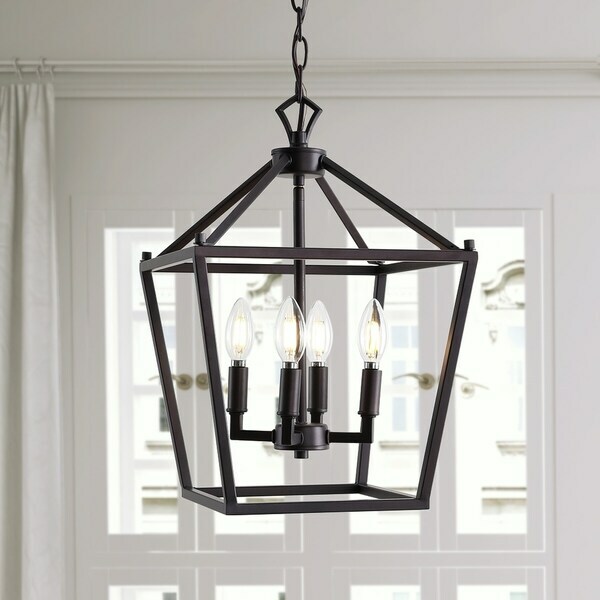 This classic lantern pendant light features a metal caged frame of negative space with exposed bulbs that illuminate from within the center. The shape of the fixture is inspired by iconic street oil lanterns. The pendant light suspends from a chain link that is adjustable to allow the fixture to hang only 22"down, or up to 94" from your ceiling, where it anchors with a round metal canopy. Dimensions 12.0 In. X 12.0 In. X 18.0 In. The pendant is just the right size for our small foyer; since it doesn't have any glass on the sides, it is much easier to care for than our previous one with glass. I love the simplicity and it gives off wonderful bright light. Yes, this item is dimmable. Updating a house we just bought and liked the look of it.